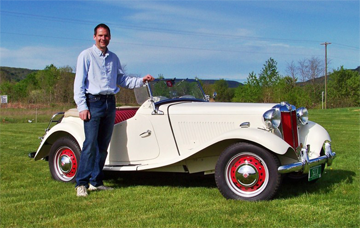 Longtime VAEer, Lloyd Davis (pictured here), and club member Carl Thompson now own this Franklin. 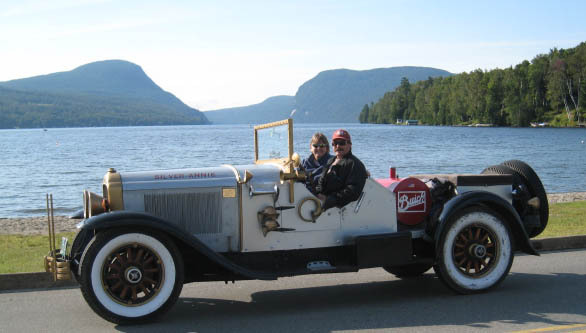 That is how the ‘partnership’ started for the owners of this 1921 Franklin Runabout. Lloyd Davis and Carl Thompson first met while working at the Quebec Cigar Company in Rutland in 1973, and have been friends since. Carl tells Wheel Tracks this little story from 1975……… I had to shop for a new “used” car and Lloyd helped me find a 1973 Plymouth 4-door sedan, with air condition-ing. Lloyd pointed out AC was not necessary, and a waste of money, in Vermont. That summer, working in the old brick building with one small window, and 104 degrees inside the warehouse, it got hot. At the end of the day Lloyd asked if I could give him a ride to Rupert, Vt. He said he had forgotten to leave the order slip on a delivery that had been made earlier in the day. He commanded that the AC be turned on! The conversation quoted on this issue’s front page happened in 2014 and Kate West sold the new partnership, the 1921 Franklin, soon after. 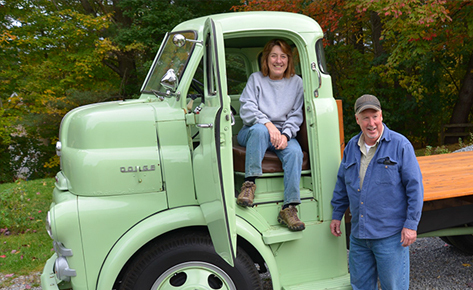 Kate and Adrian West lived in Morrisville, Vermont and after Adrian passed, she had the job of finding new homes for most of the collection, that included the Runabout. 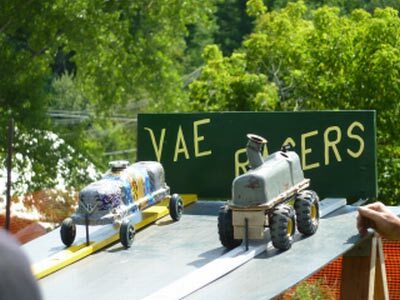 Another VAE member remembers a story about the Franklin from the mid 1950s when VAEer Rod Rice owned the car. 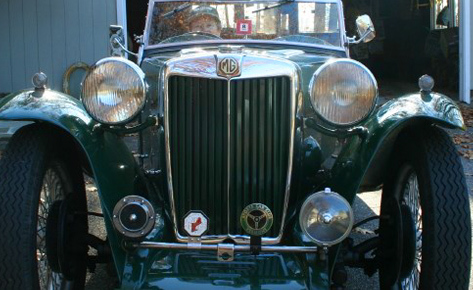 Rod had owned it from the mid 1940s and as his family was getting larger he had decided to look for a larger car. He must have liked air-cool Franklins because he had his eye on a 5-passenger Franklin that the Fuller family owned in St. Albans Bay. 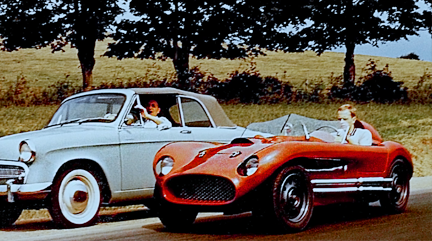 Another piece of 1950s information is that Gael Boardman of St. Albans at the time, had eyes for the Franklin Runabout. So, a deal was struck where ,if, Gael could buy the Fuller car then he and Rod would make a trade and everyone would be happy. The deal never happened but the story places the Runabout in Rod Rices possession at that time and stored in a garage in Starksboro. The next turn for the Runabout was when Rod Rice needed work done on his Bentley and Adrian West happened to own a body shop in Morrisville. The Franklin ownership then changed to Adrian in exchange for the Bentley work. This date is fuzzy, possibly in the 1960’s. The Franklin then began a complete restoration in Adrian West’s shop and is basically what you see today. Adrian died in January 2008. If you check the VAE Roster, you will find that Lloyd Davis has owned another Franklin for many years. 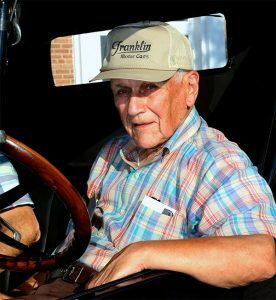 Along with being a charter member of the VAE, Lloyd has also been an important member of the Franklin Car Club where he was the long-time club librarian until just a few years ago. 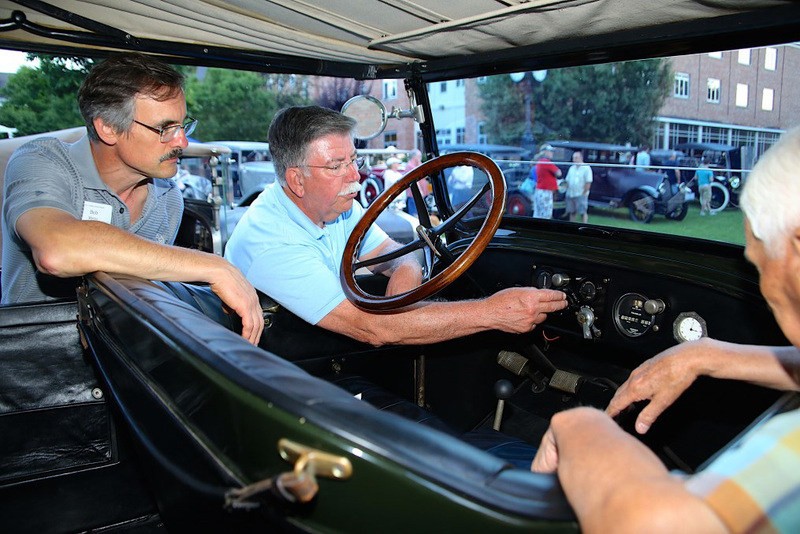 Lloyd is an authority on Franklin history, and the many mechanical nuances of these wonderful air-cooled cars, that were manufactured in Syracuse, New York. New Franklin owners over the years, throughout the country, have been able to more fully enjoy these cars with Lloyd’s detailed guidance and good humor. You might notice a slight difference with two photos on this page. 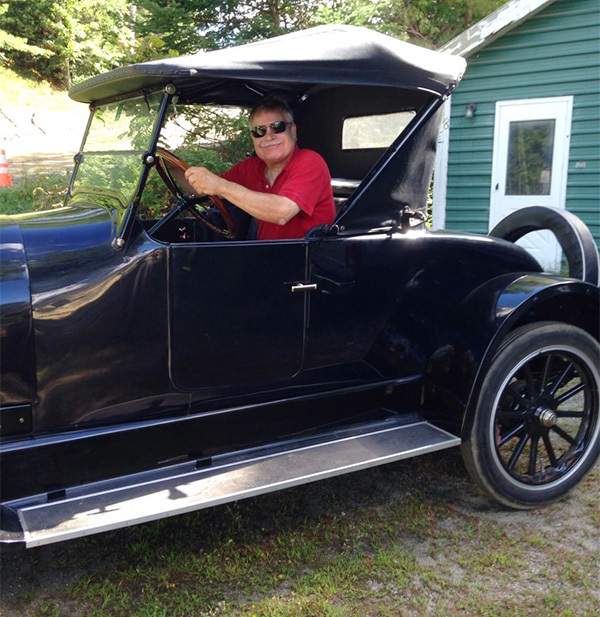 It took Lloyd a while, but using his many Franklin connections, he was able to find and have restored the wire wheels you see. Lets hope we will see this “Lloyd/Carl partnership” Franklin at a show this coming summer. Editor’s notes…. A total of 8961 Franklins were built in 1921 and 214 were Runabouts. 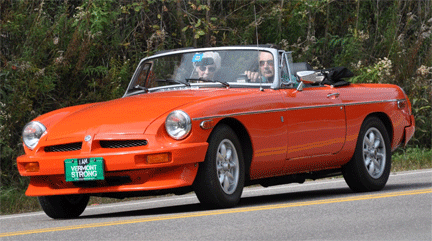 300 Roadsters were also built. Other models such as Coupes, Demi-coupes, Victoria coupes, Touring limousines, Touring car, Sedans, Broughams, Cabriolets and Town cars were also part of the line-up. 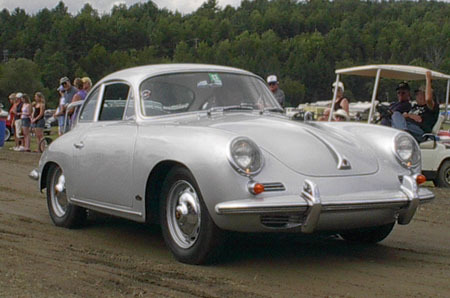 There were even 99 chassis built…. 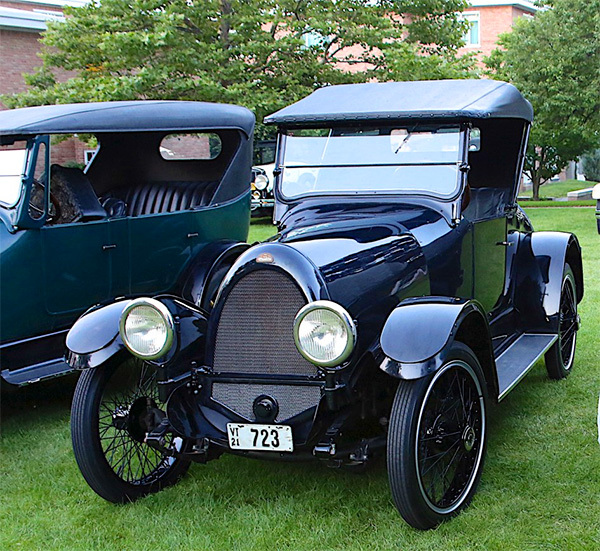 Franklin make the 9B series from 1916 through 1922, of which this Runabout is one…a 9B. It has a 6 cylinder engine that produces 25 HP and gets about 20 MPG. It has a 3-speed transmission and full-elliptical leaf spring suspension. Franklins were known as great desert cars because they could handle the high temps without overheating the engine. A great story , and an added bonus of a long friendship between Lloyd and Adrian West and Carl Thompson. 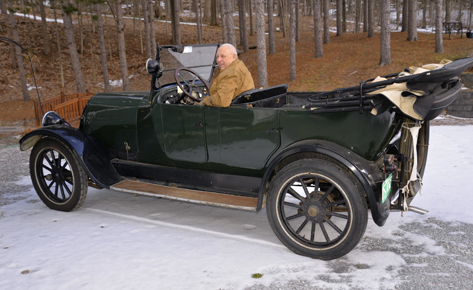 The car was shown and driven at the Franklin Trek in Cazenovia, N.Y. last summer, and the wood wheels were exchanged for the wires at that time. Lloyd had a grin on his face from sun-up to sun-down all week at the event, and the car ran like any good Franklin always does – without any problems. Thanks to John Rendemonte for posting the link.